Description: I first read about this mystical place about 8 years ago. Back then it was reported that by now (summer of 2005) that all of the giant Hemlocks in this wilderness would be killed by the Wooly Adelgid. I’ve hiked in venues to the north, east, south and west, always seeming to bypass RDW. I finally made it out there. Although the plight of the kings of this forest continues there has been some kind of temporary remission. There are still many of these majestic trees to see although many more are dead. This is a 15.8 mile outing with the highest elevation gain being about 1700 feet, most on the first day. The initial 5 miles up the draft are relatively easy once you subtract out the 20+ draft and stream crossings. These can make the hike difficult during periods of high water. Personally, I don’t mind getting my feet wet but whether the water is high or low slippery rocks can be dangerous. Take appropriate caution! In between crossings you’ll alternate between wide woods roads and footpaths as the trail bypasses severely storm-damaged portions of the original road built by the CCC in the 30’s. There are a few good campsites “in the bottoms” but this hike gets you, after a substantial I mile climb through a rocky area, to the cream of the crop at Hiner Springs. You have your choice of a large grassy meadow on one side of the spring or camping under a couple of the old silent giants with Hemlock needles as your mat on the other side. The next day takes you past Hard Scrabble Knob (A side trip up there adds about a mile to this trip as described) to the Shenandoah Mt Tr. This is one heavenly trail as ridge walks go. You’ll turn south here and follow the ridge back to the Road Hollow Trail. There are virtually no rocks on it until you turn off onto the latter trail. You’ll be mostly walking on grass, pine needles or leaf mulch for 5.5 miles with mostly gentle hills to walk up and down. We found just 2 or 3 full views along the trail but there are places where the trail goes behind the ridge. I’m sure some quick scrambles to the top at these spots bring even more views. The Road Hollow Trail is a teaser. It’s rocky in places and changes elevation several times in both directions … as if its not sure it really wants to take you back down to the draft or not. Eventually it does. The hike starts at the kiosk behind the picnic area, at the end of a gravel road. 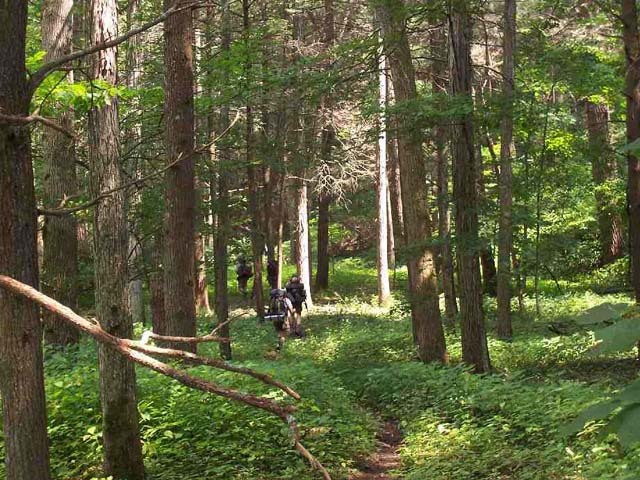 The Shenandoah Mountain Trail is part of the Great Eastern Trail (GET). Trail Notes: Most trail intersections are signed. There are no blazes. Currently all crossings of the Draft are marked my cairns but these can be easily removed by swift water. A little bit of scouting will find the well worn trail on the other side in most cases. From the kiosk walk up the main trail that parallels Ramsey’s Draft. There are 2 trails to the right. One leads to a campsite while the other crosses the Draft to connect with the Bridge Hollow Trail. Soon after that pass Road Hollow Trail on the left. This is your return route. In about 0.75 miles make your first crossing. You’ll do this over 20 times so trying to describe each crossing here is futile. In 2.4 miles from the beginning cross Jerry’s Run. The Draft will still be visible to your right. There will be a trail heading up Jerry’s Run before the crossing. Ignore it. Immediately after the crossing pass the signed junction with Jerry’s Run Tr on the left. There is a nice campsite here. Continue crossing Ramsey’s Draft as you ascend. The trail will become steeper and rockier. 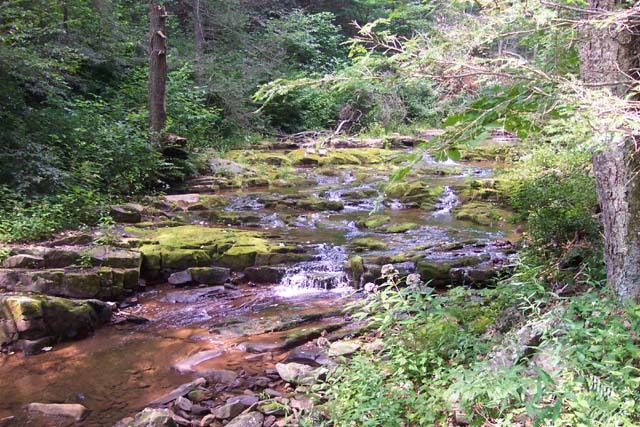 In 3.88 miles from Jerry’s Run arrive at Hiner Springs and your campsite for the night. Note the sign for Bald Ridge Knob on the right. 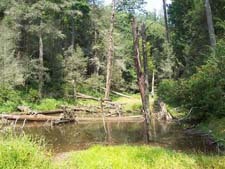 The USFS map calls this Hiner Spring Tr but it does connect with Bald Ridge Tr just the same. If, for some reason, you are doing this loop in reverse be sure you do not take this trail. Ramsey’s Draft trail is hard to spot in this direction while the other trail is quite obvious. On day 2 continue up Ramsey’s Draft Tr. At 0.26 miles arrive at Hard Scrabble Tr. The option to visit it is yours. If you do add 1.0 miles to your trip. Continue straight on Ramsey’s Draft trail for 0.89 to the junction with the Shenandoah Mt Tr (left and right) and Tearjacket Tr also to the right. (I’m not actually sure where this trail goes. It’s not on the USFS map but seems to go to Tearjacket Knob. Don’t know if there are any views up there or not. Must find out.) There appears to be a relatively reliable spring just over the crest of the hill here. Turn left onto Shenandoah Mt Tr to continue. Arrive at the junction w/ Sinclair Hollow Tr to the right in 0.49 miles. Stay straight on the Shenandoah Mt Tr. In another 4.22 miles pass the junction w/Jerry’s Run Tr on the left. Continue straight on the Shenandoah Mt Tr. At 0.99 miles from the last junction arrive at Road Hollow Tr. Turn left onto Road Hollow. In about 2.42 miles arrive back at Ramsey’s Draft Tr. Turn right and retrace your first steps back to the cars. Critique: Hiked this on Memorial Day weekend with my husband and we could not have picked a better hike or chosen better weather. 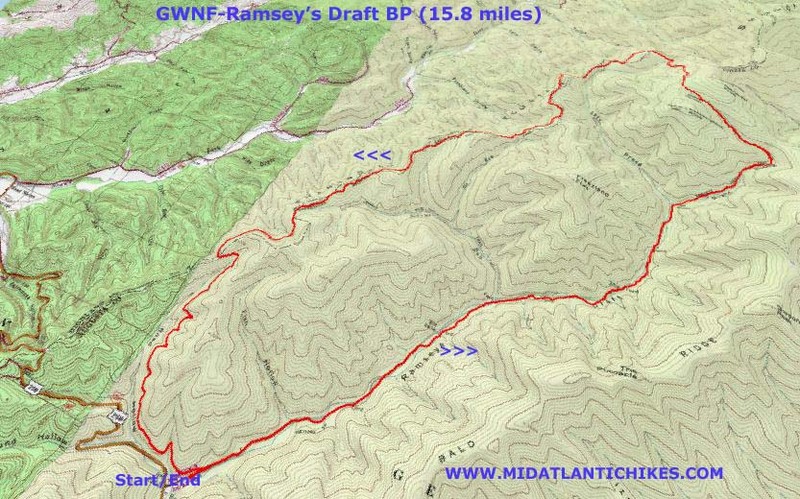 We ascended Ramsey's Draft Trail and returned via Shenandoah & Road Hollow Trails, as per Mike's trail notes. RDT indeed has 20 water crossings, the lower crossings required sandals and the upper crossings were managed by rock-hopping, or rock-stretching in some places. This past winter was a tough one as can be seen by the numerous blowdowns on RDT. . .some mighty big trees blocked the trail and it will take awhile before they can be cleared. Nothing that can't be hiked over/under/around with a bit of patience. Lots of very pretty campsites along the Draft. . .at Hiner Spring at the top, we found ourselves alone and set up our tent on a nice flat spot. As we were eating supper 3 hikers arrived, they found themselves another flat area on the other side of the spring. The spring was open and flowing, so water was not an issue. Next day was an easy hike up the remainder of RDT, then it was all downhill on the beautiful Shenandoah Trail to Road Hollow. All in all a great hike, almost total solitude which was nice for us, as it was our 32nd anniversary hike. 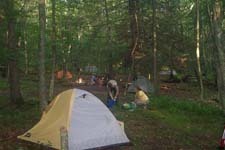 Critique: A group of nine of us from midatlantic backpackers meetup camped at the trailhead Friday night and then headed up the draft trail Saturday morning. The draft was high and unruly, and the trail was washed out pretty bad in the bottoms. We had to perform a bushwack and an indiana jones-esque log crossing to regain the trail. In total I counted 16 draft crossings, some of which required waist deep wading for some of the shorter members of the group. Fortunately, everyone was a trooper and saw the adventure in it. Weather was perfect in the 60s with sun so once we reached Hiner Spring we lit a fire and dried everything out. The draft trail is pretty undetectable during the final mile to camp so we ended up just following the stream. I can't imagine doing the loop in reverse. Sunday on the Shenandoah Mtn trail was night and day from our experience Saturday - no ascents, no rocks, no water crossings...only flat gentle trail. In spite of the obstacles, the hike was a blast, a truly memorable experience. High marks! I'm glad I finally checked this off my list after two planned trips here that fell through. Critique: I love this area. We hiked this loop as an overnight on October 1st and were surprised when almost an inch of snow that fell in the evening. There were a few fallen trees across Ramsey's Draft trail and Shenandoah mountain trail but overall everything was well maintained and the area was beautiful as ever. 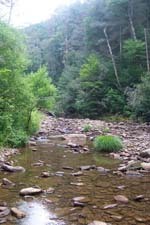 Keep in mind there is no reliable water on the Shenandoah mountain trail. It was nice to see that there are still some healthy looking hemlocks at the higher elevation! 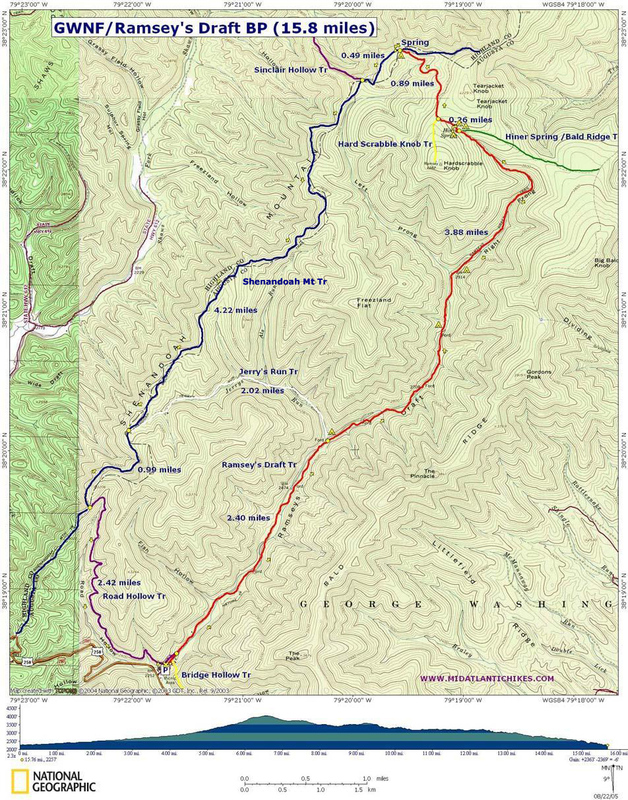 Critique: We did this hike over a Saturday and Sunday, camping at a nice spot at the trailhead on Friday. We took the eastern route, going up Bald Ridge Trail to Tearjacket Trail, and then down Ramsey's Draft Trail. The Bald Ridge section had some nice views and the trail conditions were good for the most part. There were some nice campsites along the ridge, but be aware that this section of the hike is very dry---the "pond" at the junction of Dividing Ridge was completely stagnant and I wouldn't pump from it unless you really had to. We ended up getting a bit dehydrated as the temperature and humidity were high that day. Hiner Spring was also very nice, though a bit crowded when we arrived. We hiked down the draft a bit to good campsite (there are several along the draft) and were able to cover about 11 miles the first day without trouble. Sadly, the hemlocks along the draft are almost completely dead, and downed limbs and trees made trail conditions difficult at times, though by no means impossible. The draft was also fairly low for us so the stream crossing weren't too difficult, though I certainly see how they could be with high water. Many portions of Ramsey's Draft Trail were very smooth and clear and made for easy hiking. I would saw the overall difficulty when we were out was moderate. We saw some wildlife (a turkey, bear, and some dear) and wildflowers were in bloom. We also spotted blueberry and blackberry bushes that would be a nice treat when in season. Without the hemlocks, though, I'd say that this was a pleasant but unremarkable hike. You can definitely get a sense of how big they are from the remains left behind but it isn't quite the same as seeing a live forest. But overall a good trip with very nice camping. Critique: I did the other version as well. Hiked up Bald Ridge and then back down the draft. I planned to do the hike in a single day so I hoofed the Bald Ridge trail planning to take it easy on the downhill run along the draft. Unfortunately, the winter was not kind to the draft. There were dozens upon dozens of recently downed and MASSIVE tree's across the trail and the draft. It was sad to see such terrible damage. And it made the 'easy' downhill trip and grueling monster. According to my GPS it added nearly 1 1/2 miles to the trip with all the detours the tree falls necessitated. Fortunately someone had recently surveyed the trail for restoration leaving well over a hundred stakes and flags for the work to be done. Without those guiding me it could have taken perhaps a few more hours and dangerously into the evening. In all it was 17.2 miles and took me over 11 hours without a single break. I believe the hike is normally closer to 16. I recommend a two day backpack. Doing this as a day hike leaves little room to enjoy it. Critique: This is a long but not particularly challenging hike -- but a great one. The suggested route going up Ramsey's Draft instead of down it on the return loop is a sensible one. Many younger Hemlocks appear very healthy. A few of the giants may still have some life near the top. A caution: there was a small dead animal, squirrel or perhaps a young possum under the water in Hiner Spring itself (within the small stone walls). It's hard to imagine it fell in and drowned. I hope someone didn't do it deliberately. I think the area at the junction of the Ramsey's Draft and Shenandoah Mountain and Tearjacket trails is even prettier than Hiner Spring -- and Shenandoah Mountain Trail is a gentle joy. Critique: Went with a group of 5. Numerous camp sites right at the head of the trail so driving up after work on Friday and spending the night is very easily done. The draft was flowing well but iced over in a lot of places. The numerous crossings proved a little difficult in some places cause of the ice but we managed. Camped at Hiner Spring. Lots of bear tracks, saw a few deer. Hiked out the next day along with some very nice vistas, but also very icy along the trail. 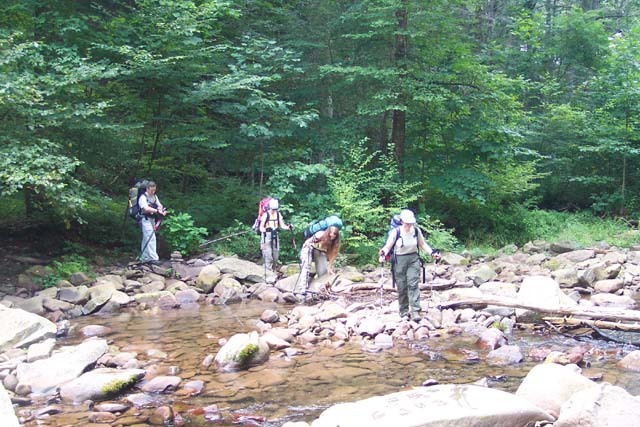 Was a great hike, will be back with my fly rod for some of those native wild brook trout I saw crossing the draft. Critique: This was a fantastic hike, a little challenging for beginners, but a good experience nonetheless. We started hiking up the draft as suggested but ran into heavy rain with lightning on the last push to Hiner Spring Meadow. This dampened the spirits of my friends and the following day we decided to follow the same trail down instead of the longer ridge trail with promises of more elevation gains, so I cant comment on that part of the trail. We did meet other people at the meadow campsites that complained about the lack of reliable water sources and recommended stocking up before continuing. As far as the draft trail there were several patches of shoulder high poison ivy but luckily the water level was low making for very easy crossings (and the number of crossings gave us many opportunities to wash off). Look out for the cairns for crossings, as someone else mentioned, they are not always visible being obscured by growth. Most of the trail following the old graded road is bordered by stinging nettles and I would highly recommend pants for this segment. Following the washed out bridge the elevation gain is more consistent and the forests encroachment of the trail begins to become more evident with several off-trail excursions to find routes around fallen trees. All-in-all this is a great experience that reminded us of trails we had done on Washington's Olympic Peninsula with all the moss and growth. Highly recommended, I will return to Ramsey's Draft to complete the loop as soon as possible. Critique: It was a cold weekend to do a hike with lots of wet stream crossings, but I had a great time with a couple friends doing this trip as described, except we camped at Hardscrabble Knob instead of Hiner Spring. There was one other group hiking in the area, but after passing them near the beginning of the Ramsey's Draft trail we didn't see another soul all weekend. Saturday took longer than the mileage would indicate because of all the crossings, only about half of which were rock-hoppable or otherwise dry. Also, Ramsey's Draft Trail itself is pretty poorly maintained at this point, with lots of dead trees requiring fancy footwork or off-trail excursions. The trail was difficult to follow in a couple places, but we didn't have any major problems. Until we got to Hiner Spring that is, where we lost the trail completely. After wandering around the campsites (which btw are as beautiful as advertised) for a while, we just struck out in the right direction to meet up with the trail up to Hardscrabble Knob and eventually found it. 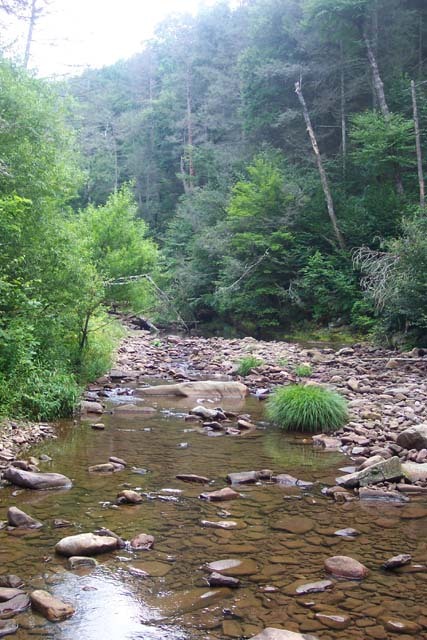 There are some nice campsites near the knob, though nothing like the Hiner Spring sites. The knob itself offered a nice view, though only a small section of it was unobstructed. The temperature dropped to the low 20s and it sleeted on us Sunday morning, but the hike on Sunday was really easy, no stream crossings and almost totally flat. The forest was kind of sad to walk through, especially the Saturday section (Sunday's hike seemed to go through more evergreen areas that are still doing fine). There are so many totally devastated parts, though there is new growth cropping up everywhere (in some cases encroaching on the trail). I can't really imagine what it must have looked like 10 years ago. 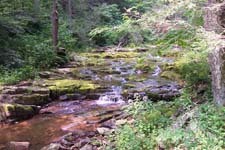 Critique: We followed this hike as described above and found it a very enjoyable overnight hike. 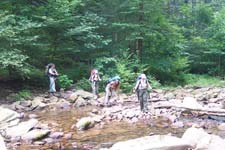 Due to lack of rain, there was very little water in the streams so crossing was very easy. Thankfully there were some flowing pools so we did have some water available. We decided to stock up on water before the climb to Hiner Spring. That climb was definitely a workout- lots of big rocks, fallen trees, and steep sections. We camped at Hiner Spring (the spring itself was bone dry) and were rewarded with the place all to ourselves. Herds of deer roamed around camp all evening. The next morning a small herd decided to check us out and appeared not to be afraid of people at all. We packed up and continued up to the Shenandoah Mountain Trail and followed that south as described. The ridge hike was a nice long stroll. Only disappointment was lack of good views, but the pine needles were a nice welcome cushion under our feet. The Road Hollow trail is definitely interesting. Very rocky, and like described, can't seem to figure out where it wants to go. Some fallen trees made travel a bit more difficult but overall, a nice descent from the ridge back down to the car. The weather was perfect, the trees beautiful (though not yet in full color), and there was plenty of wildlife to enjoy. Lack of dependable water sources and a recent fire ban put a damper on our plans, but the hike overall was VERY enjoyable and I highly recommend this hike for those looking for a refreshing over-nighter. Critique: I've hiked this wilderness area many times over the last 10 years. It used to be secluded and unknown; until a national hiking magazine publicized that fact. I've hiked there in the fall and seen over 30 people in the area overnight. They were both hunters and a class from a local college. But sometimes you're alone, especially if you avoid the weekends. As George Young indicates, in some seasons there are extensive tracts of stinging nettles. The effects are temporary, giving you a valid reason to lounge in the river. Some of the trails are strenuous, some are quite easy. This is a wonderful place to spend time exploring and by linking up trails, you can stay out for long periods. Plan well, avoid the weekends, and you'll love it. Critique: I did this hike last weekend in the manner that wacbzz described. I like the idea of getting all of the harder stuff out of the way on the first day. 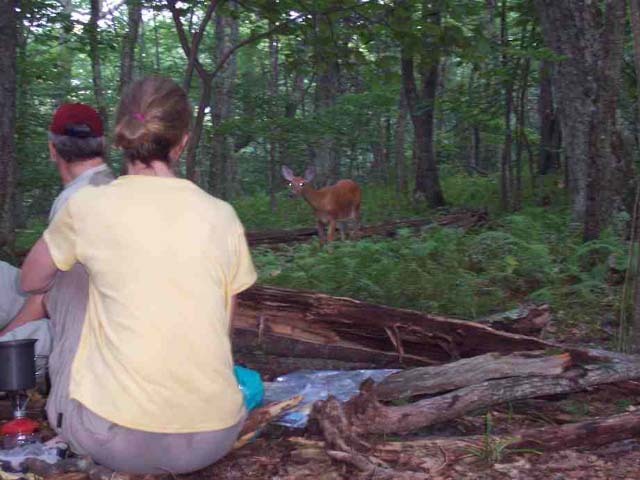 There are a number of campsites to choose from on Bald Ridge Trail, but no water. The "pond" is only for the truly desperate. 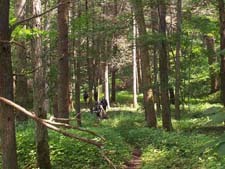 This hike makes for a long first day if you go all the way to Hiner spring, but a leisurely hike out on the second day. 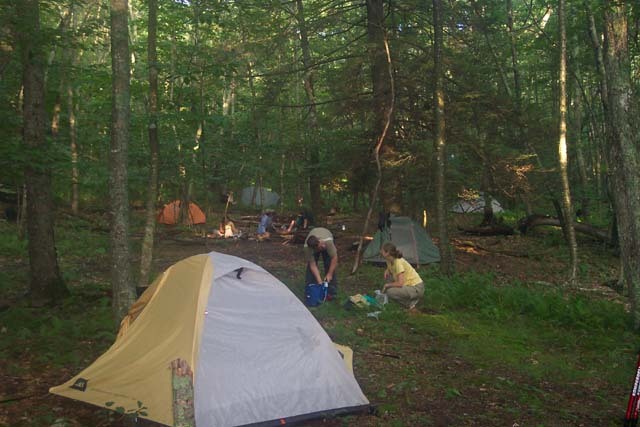 When I did this the campsite at Hiner spring was occupied by >20 scout tents (many more than wilderness ethics advise). They were well behaved and I managed to jam my tent into the woods a quarter mile downstream. All in all a good hike. Kinda sad to look up at the massive standing dead hemlocks. In a few years those beasts are going to create a big mess when they drop. Critique: My girlfriend and I did the route that wacbzz suggested. The Bald Ridge trail is pretty difficult, it also did not help that it was 78 degrees with no tree cover yet. The hike is also pretty relentless. Unlike most ridge trails there are alot of up and downs as you travel from peak to peak. One thing to realize is that the entire first day which is about 11 miles your going to have to carry all your water. The only place to fill up is once you get to Hiner springs. Some other reviews say there is a pond about 6 miles in, be warned it is very stagnent, filled with tadpoles, and I decided to pass even with my filter. I also agree with the other critque that long pants can be your best friend. Overall I liked the trail. The first day along the bald ridge trail is more effort than the rewards you get, but the next day in Ramsey's Draft was a lot of fun. One other thing, the Bald Ridge trail is much more secluded. So if you can handle the difficult trail and don't want to run into a lot of other people, this would be the way to go. Critique: My wife and I did a version of the hike listed here. Instead of going up the Ramsey's Draft trail, we followed the Bald Knob trail from the beginning across the draft and followed the ridgeline up to Hiner Spring and Hardscrabble Knob. THIS IS A VERY DIFFICULT CLIMB. It is in many places very steep with a lot of sidehill climbing. However, the views and wilflife sighting are worth every calorie spent. After spending the night at Hiner Spring, we began the decent of Ramsey's Draft trail. Be very careful. The trail is difficult to follow out of Hiner Spring. It is not marked and very rocky. Once further down the trail, however, the views of the wilderness are so very impressive. After coming down Ramsey's Draft trail, I feel this is the better way, rather than ascending the trail, because of the many draft crossings that would lead to easy confusion. In addition, the climb up to Hiner Spring this way is more difficult than the website description makes clear. It is all uphill with no level hiking once one turns left to go up the right prong to Hiner Spring. All in all, this is an AWESOME hike, but one should be prepared for a lot of uphill climbing and confusing draft crossings should you choose to hike the way the website recommends. 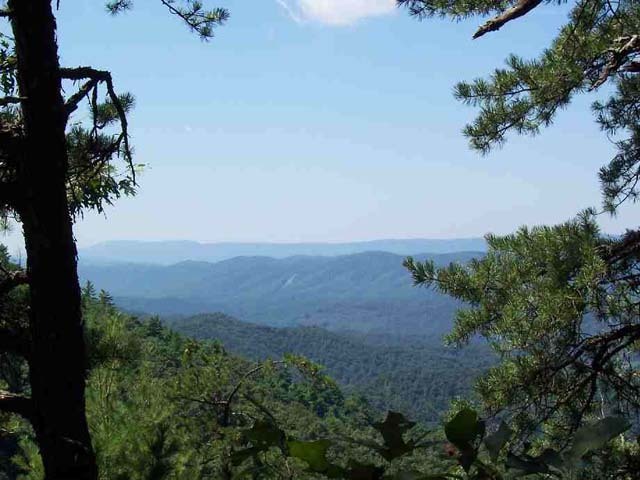 M. R. Hyker Notes: I have had a couple of reports of people hiking in from the Shenandoah Mt Tr who could not find the Ramsey's Draft Trail at Hiner Spring and ended up a good distance on the Bald Knob Tr before realizing their error. That is one reason why I designed the route to go up the creek. 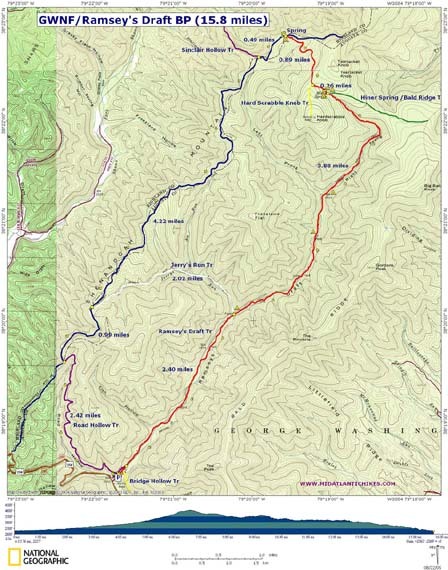 Other reasons for the direction of my route: more options to camp should one decide to stop early in the hike, a substantially more gradual elevation profile going up the Run VS going up Bald Knob, easier, safer, better views going UP the Run and actually the fords are not all that difficult to fine. The only slight exception might be the one near Jerry's Run. I plan on doing wachzz's route next year but in reverse so I'll have both sides of the valley covered.